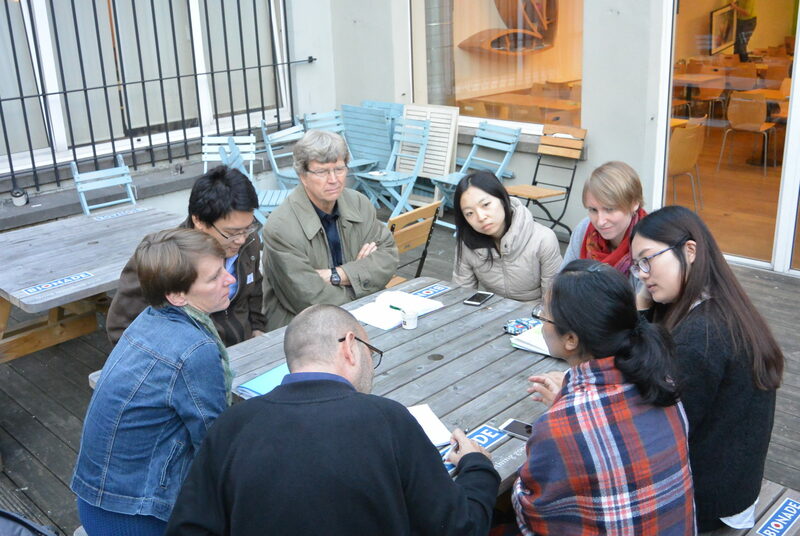 After the welcome speeches of Oliver Radkte (Robert Bosch Foundation), Nora Sausmikat (Stiftung Asienhaus) and Maeve McLynn (CAN Europe), this year’s twinning participants introduced themselves and their common work focus during their exchange. 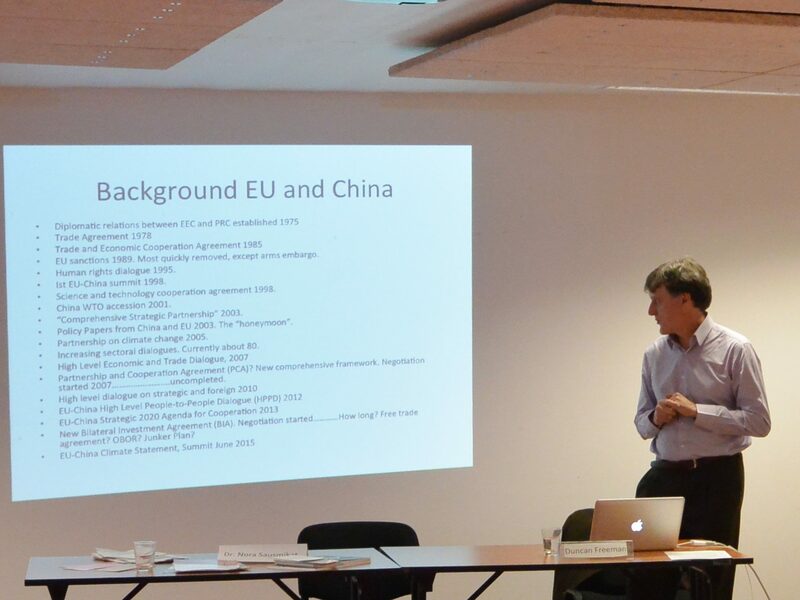 Xin Song, Sanjeev Kumar (Change Partnership) and Lin Jiaqiao (Rock Environment and Energy Institute) opened the workshop with a comparative presentation of the political structure in the EU and China to ensure a (at least) broad overview of the respective structure for each participant. 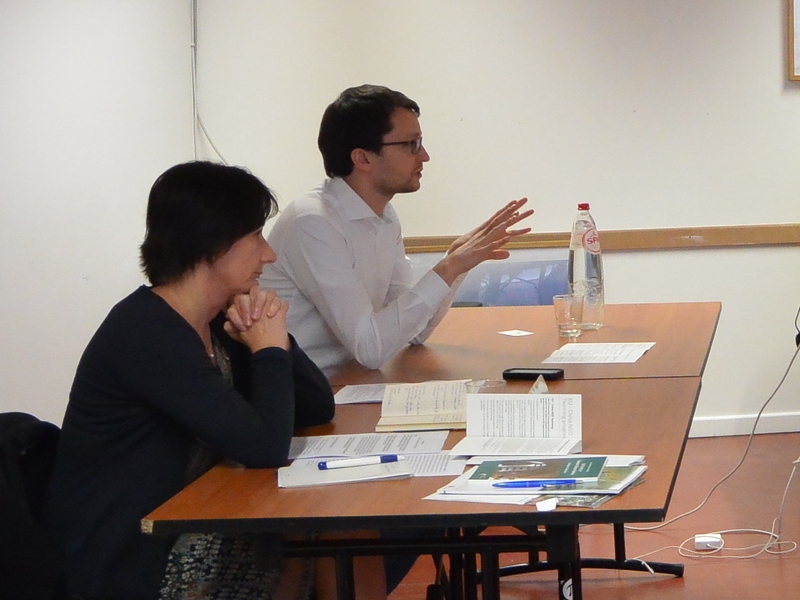 After having introduced attendees to the four main bodies of the EU and the decision making process, Sanjeev Kumar presented different methods, strategies and tactics for civil society organizations on how to influence the decisions on the EU level. 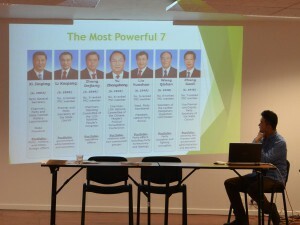 For the purpose of comparison Lin Jiaqiao introduced the participants to the political system in China, including the National People’s Congress, executive authorities and the current Five-Years-Plan. Special emphasis was paid to an introduction of China’s Energy and Climate Policy making. Xin Song concluded the opening presentation with a direct comparison of the Chinese and European political systems. The EU and China have a complex relationship. Duncan Freeman, from the Brussels Institute of Contemporary Chinese Studies, gave an overview of these political and economical relations of the EU and China and informed about cooperations and the important actors involved. In the course of the discussion round Twinning-participants were especially interested in the matter of why the civil society is not involved in the official dialogue between the two actors. Furthermore, the impact of Chinese exports to the EU and the role of Foreign Direct Investments (FDI) had been at the center of the debate. Moreover, somelight was shed on the contemporary issue of EU-China human rights dialogues, the cooperation of both actors in regards to cultural and political development as well as Chinese investments in Europe. Malgorzate Jankowska (European External Action Service) and Mathias Eberlen (Assistant to MEP Jo Leinen)) introduced their respective institution and presented the relation and cooperation the EEAS and European Parliament has with China and NGOs. After the presentations the attendees gave a lot of input on the issue of the limited involvement civil society associations have with European Politics. Theypointed out the benefits for the institutions to include NGOs in their dialogues and institutionalize the cooperation of the civil society on both sides. Moreover, the participants discussed with the experts the matter of transparency of investment treaties and bilateral trade agreements. Following the first input session, four 2013 and 2014 alumni of the exchange (Cornelia Kirchner/Organics International , Wawa Wang/CEE Bankwatch, Dave Carey/Chickenshed Inclusive Theatre Company, Ding Peng/Wuhan University Public Interest and Development Law Institute) reported on their own twinning experience and the further development of the joint work with their partner NGO. In his presentation Martin Kasper from the Directorate-General for Climate Action (DG Clima) gave a brief overview of the history and negotiation process of the Conference of Parties (COP). He reported on the climate negotiations in Copenhagen 2009, Durban 2011, Warsaw 2013 and Lima 2014, and gave additional information on actors and main goals for Paris 2015. He also explained China’s role with regard to the reduction of emissions and the China-EU Summit, and EU-China related projects (e.g. 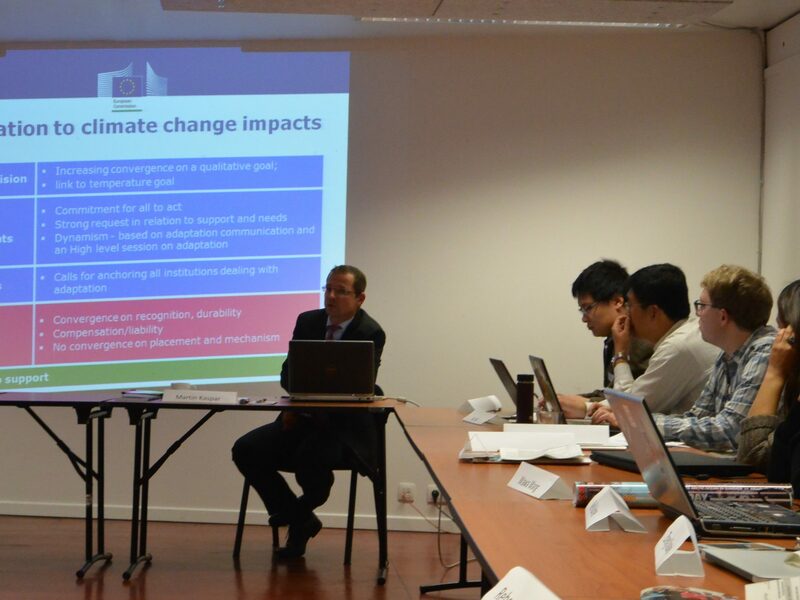 EU-China Emissions Trading System, EU-China City Carbon Partnership, EU-China Urbanization Partnership). Throughout the round of discussion many questions were directed towards the matter of fossil fuels and how climate negotiators perceive the newest developments on this issue. Next to fossil fuels, EU-China agreements had been discussed. This includes the question of how oversea commitments can be implemented into bilateral agreements and what the parameters are in order to define successful negotiations. 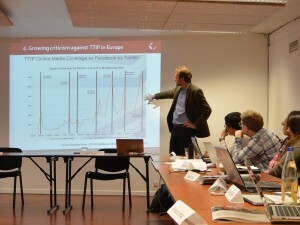 Axel Berger from the German Development Institute, shared insights into the European debate on the Transatlantic Trade and Investment Partneship. He introduced the TTIP agenda, its structure as well as controversial issues, such as the impact of TTIP on public policy making and democracy, and the potential impacts of TTIP on developing countries. The discussion that followed revolved chiefly around the ramifications of trade restrictions when states are not sticking to the requirements fixed in the climate agreement. Afterwards, questions about the implementation of low carbon development goals into trade and the progress of transparency were answered. The last input during the workshop was on the current migration and refugee crisis in Europe. Daniela Giannone, from the North-Westphalia Representative Office to the European Union, introduced the listeners to the crisis and the problems it is bringing along. Especially the distribution of refugees on the different EU member states had been central in the problematic. The participants had several questions concerning the sending back of refugees and the political struggles the EU is encountering. Many were wondering why the EU did not react earlier on the rising refugee numbers and whether or not it is possible to introduce a regulation comparable to the Canadian system in the EU. At last the migration to Europe had been compared to the inner migration of China. Posted in: Allgemein, News, News 2012, News 2013, Twinning News 2015, Workshops.